TP-4000N is a series of 4-channel DC laboratory PSUs from TWINTEX with an extensive range of applications. 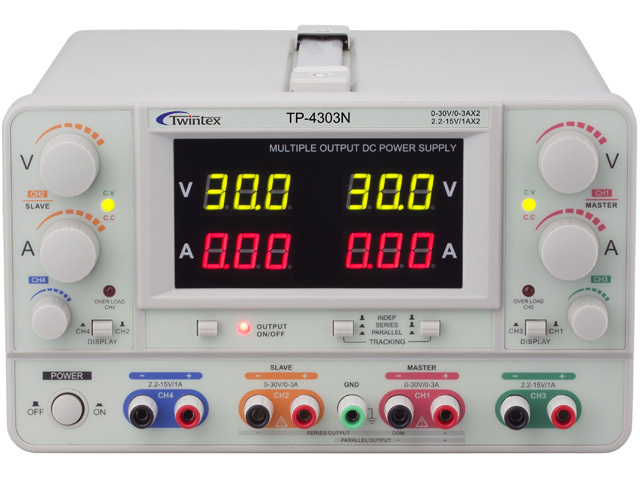 TP-4000N power supply units feature two outputs with maximum voltage of 30V (TP-4303N and TP-4305N) or 50V (TP-4503N), and maximum current of 3A (TP-4303N and TP-4503N) or 5A (TP-4305N). Two auxiliary outputs have a constant current of 1A and adjusted voltage from 2.2V to 15V. What is more, it is possible to disable an output, which allows the user to set the desired parameters with no need for disconnecting the powered device, and with no threat of damaging it by accidentally applying too much power. Voltage or current regulation modes may prove handy during operation. Colour markings on the front panel.